Recently Tamiya has introduced a new driver to their charismatic roster of drivers. 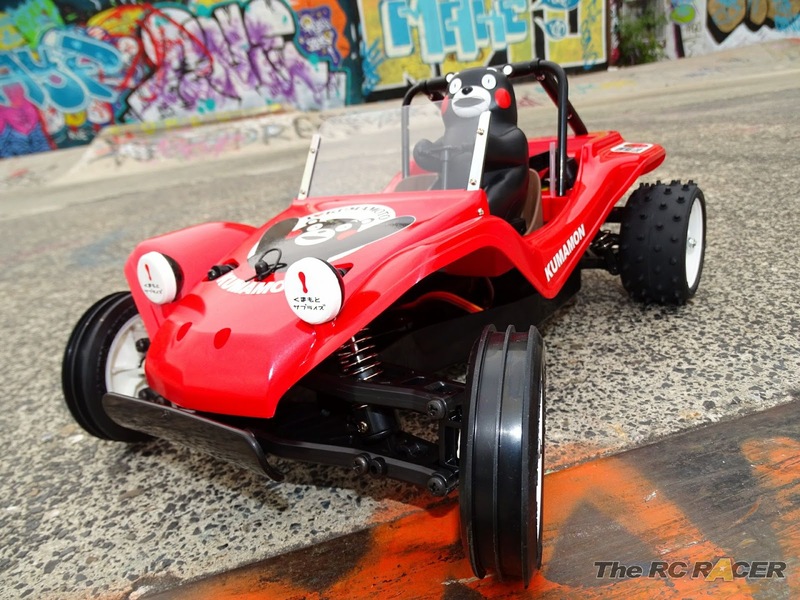 Most RC enthusiasts would recognise the iconic 'Wild Willy' but now there is a new guy in town... well not exactly a guy but a bear! Kumamon is a popular Japanese mascot. He represents the Kumamoto Prefecture, but his popularity soon exploded and he is now one of the most popular mascots in all of Japan. 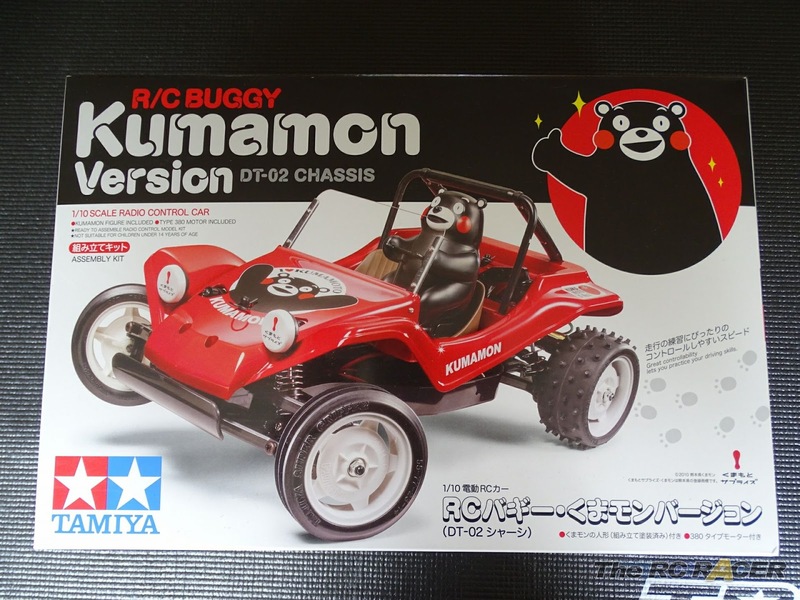 That probably explains how this crazed looking black bear has been chosen to ride this entry level Tamiya buggy. The car that he takes the wheel off is the classic Tamiya Sand Rover. 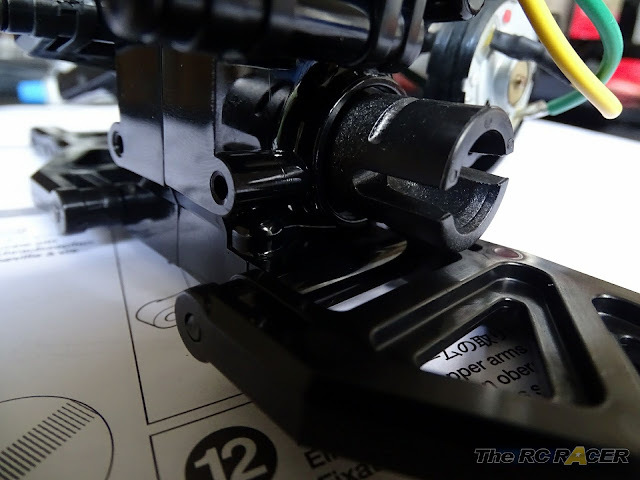 This was recently seen in the 2011 re-release and it is again mounted on the well regarded DT-02 chassis. With the third annual DT02 challenge approaching soon I was after a car to enter into the Stock class and that little bear had worked his charms on me and my children, so one was soon dispatched and arrived at my door. I opened the box and was impressed on how they had managed to cram everything into such a small package. The large ABS shell looked great and was already moulded in red, and the rest of the parts are contained on the handful of plastic part sprues and the 3 parts bags. 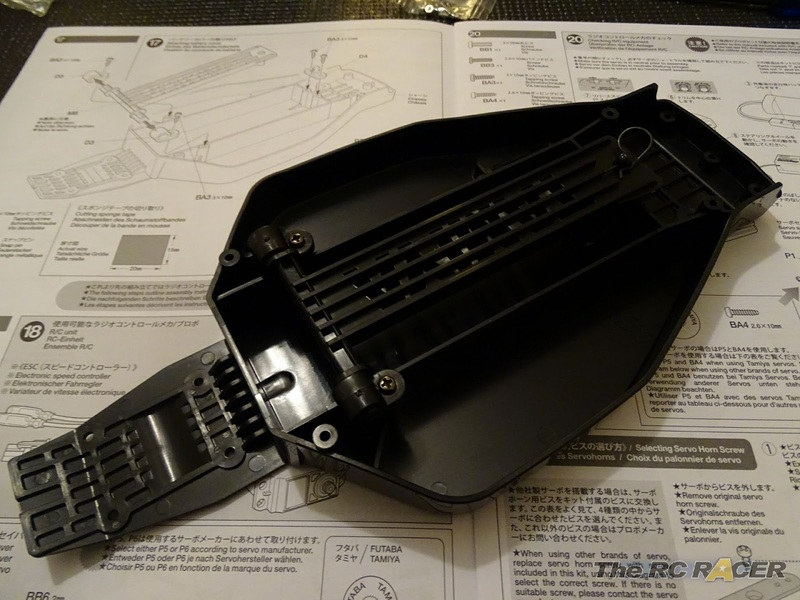 Kumamon is already pre-assembled in a plastic case, along with an optional hat and the mounting parts needed. This simple array of tools is essential as you do not want to put barriers in front of anyone who wants to enter the world of RC. Hex screws have a place, but not on an entry level kit. This is a car aimed at beginners and those who are young at heart. 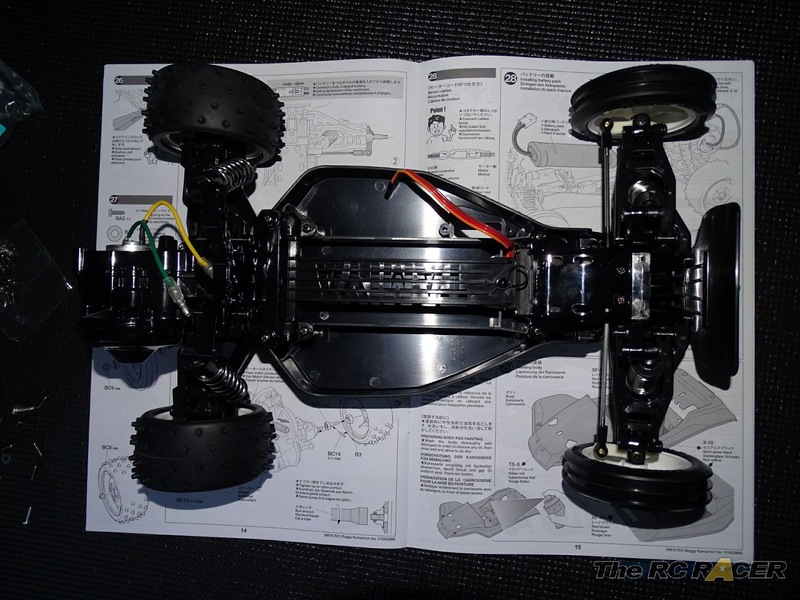 Building my first RC car was a great moment, and it's an excellent parent and child hobby activity. Tamiya still lead the way here, with all of their cars being kits, and many in the RC hobby world talk fondly about building their first Tamiya. My daughter wanted to build a car with me and so we built this one together with my son also contributing. For this build I swapped out the kit bushings for some bearings from www.RC bearings.co.uk. This car was going to be a well used runner and a beach holiday was looming. 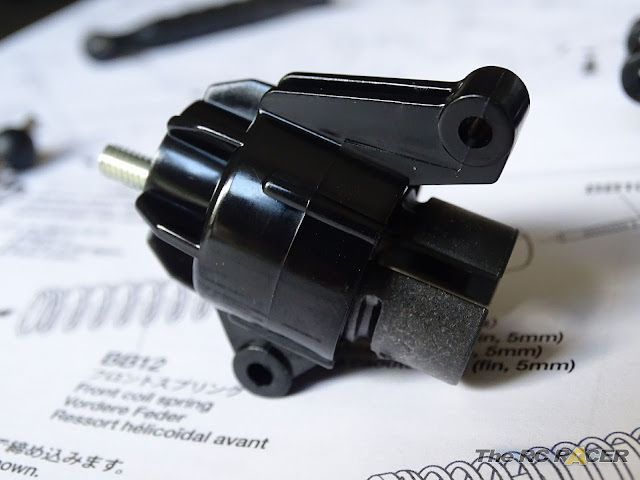 The kit bushings are fine, and they are indestructible, but I wanted to fit some rubber sealed ones as I wanted to protect them from the elements, but I also know it will be raced at the DT02 challenge so the extra speed from a bearing set will be beneficial for that. First up it's time to attach the front arms to the sturdy looking front bulkhead. The arms are very well made and really chunky, ready to take a fair bit of abuse. They are attached to the front bulkhead with chunky screw pins. Once they are screwed in, you need to check that the arms still move freely and you are then able to move onto the next step. 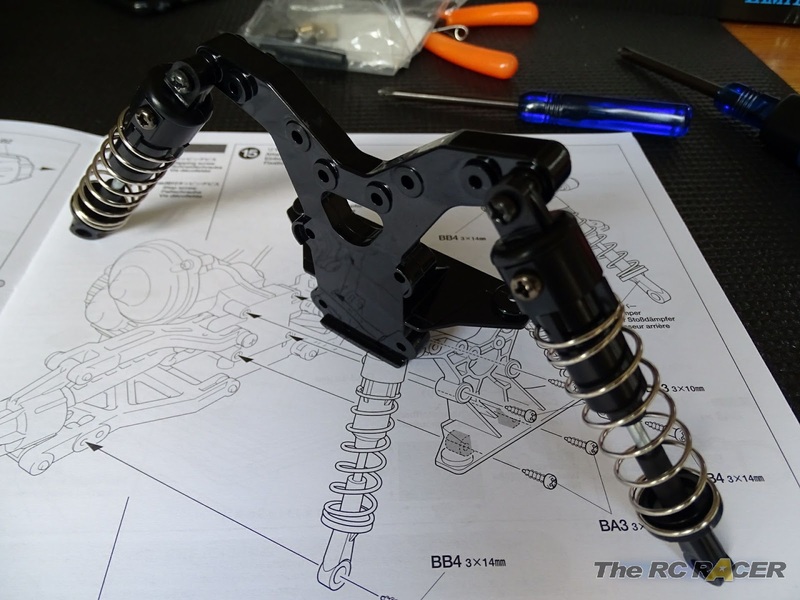 These are a simple and effective way of assembling suspension arms, much less fuss than E-Clips and suspension shafts. 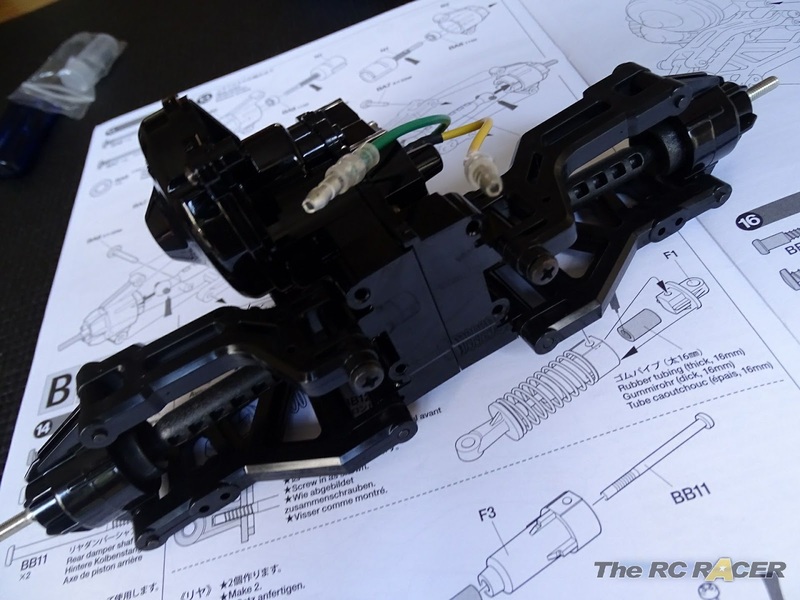 Continuing the front end assembly we now need to build the front axles. The bumper is next and as you can see it's a nice large bumper that will be able to absorb some pretty large head on collisions, and hopefully protect the shell and the driver. This screws onto the underside of the bulkhead and the whole unit feels chunky and strong. Now we need to attach the front axles to the arms, again this is done with the screw pins and they fit firmly and the whole arm assembly move freely. 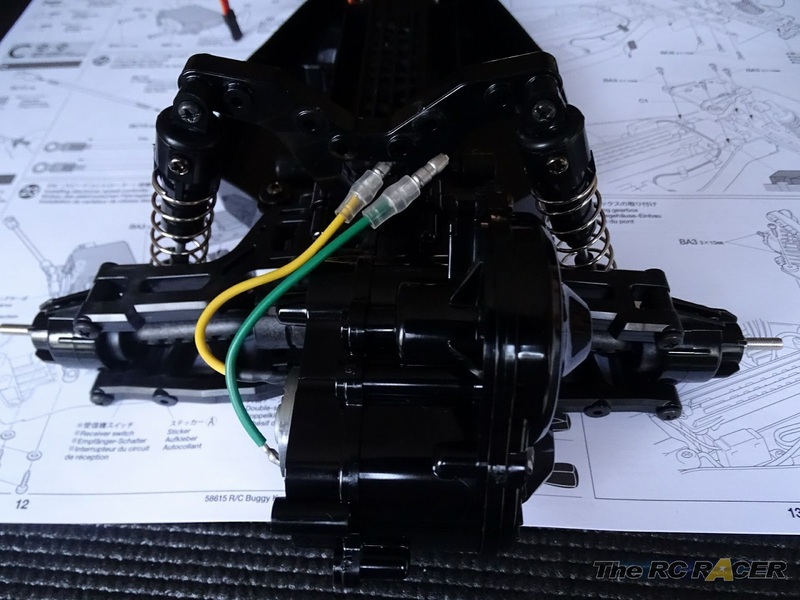 The DT02 is a rear wheel drive buggy, and that means it just have one differential that will help ensure the car can push itself around efficiently. The kit included grease is used, but you can use thicker grease to tune the diffs more. 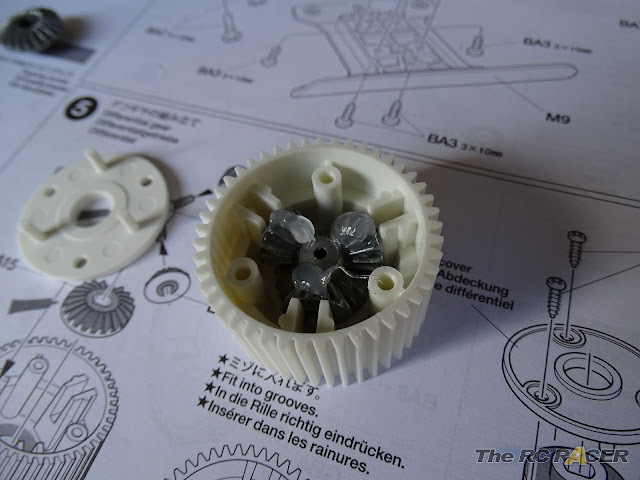 The whole differential is really easy to assemble, great for a beginner to build and I can tell you from personal experience that these are basically indestructible. I have some Tamiya's that are over 20 years old and the differentials are still working, and have never needed to be serviced! Once you screw the differential together it's time to construct the rest of the rear gear box. First up is a counter gear that has two 1150 bearings fitted at each end and it spins on a solid steel 5x45mm shaft that securely slides into the rear gearbox half. With two more bearings fitted into the internal gearbox halves, and the diff fitted we need to attach the two gearbox halves. 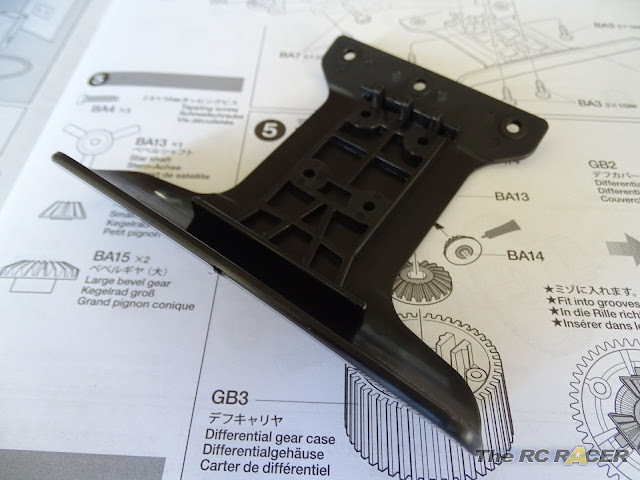 These are firmly held together with 4 screws ensuring that the gears will be protected from the dirt and debris that a buggy has to contend with. The Spur gear is next. The design here is unique to Tamiya as the spur gear also has the idler gear on the other side. 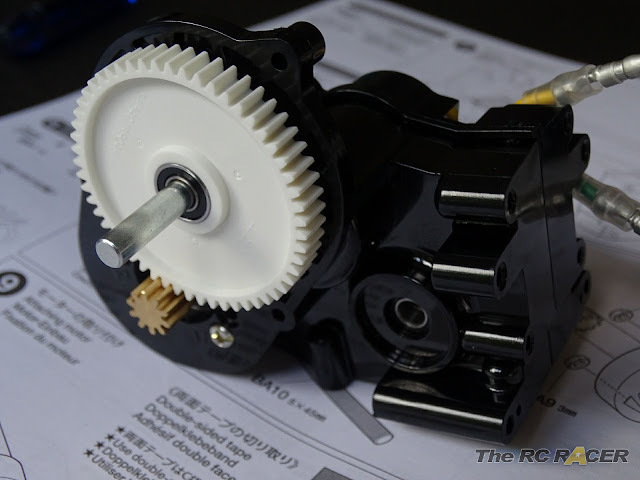 The whole piece is moulded in very tough delrin plastic and the spur gear is mounted on a steel shaft and two 1150 bearings. This design makes the gearbox bullet proof and shows the design intentions for the DT-02 chassis as fun introduction to 2WD buggies. 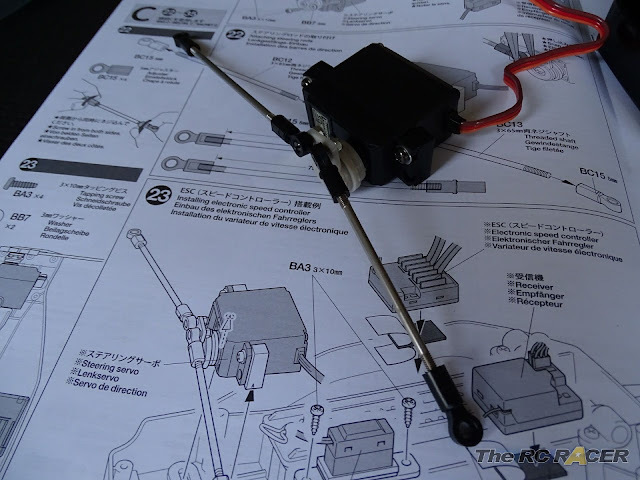 The Kit comes with a 380 motor and an adaptor to mount it into the gearbox. The 380 motor adapter just tricks the car to thinking it has a 540 sized motor fitted. The DT02 gearbox can take any std 540 size motor, I have fitted the 380 motor for this build, but I will swap it out for a faster 540 sized motor when I get to race it at the DT02 challenge later in the year. The kit included 380 motor already has a 10T brass pinion fitted on the shaft. The DT02 cars allow you to only mount the motor in two positions via some fixed motor mounting screws . This ensures you get a perfect gear mesh every time, great for beginners and it still gives you a choice of gearing. 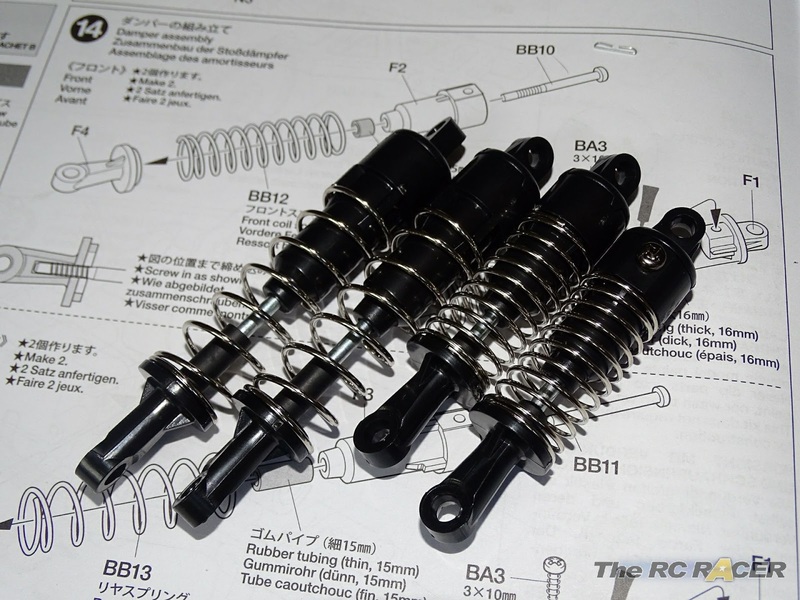 The DT02 cars all use 0.8 Mod pinions (very close to 32dp). So when you fit a 540 motor you will need to buy one of the following pinions sizes depending on your preference. 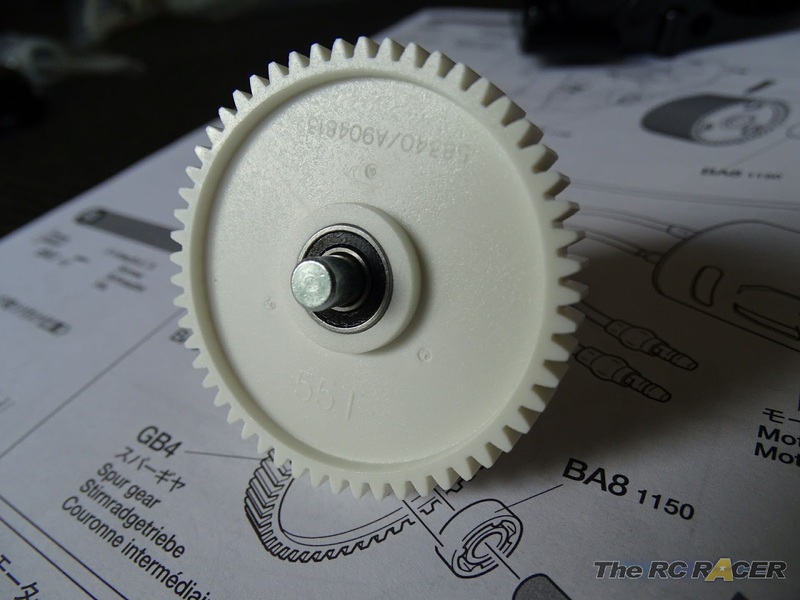 The spurgear is now hidden by the spur gear cover to keep out dirt and it is securely attached. The rear arms are next and these are also mounted with screw pins. The whole assembly feels very solid with those chunky arms, and excellently finished plastics. One thing that you do notice is that the upper rear arm can hit the spur gear cover. 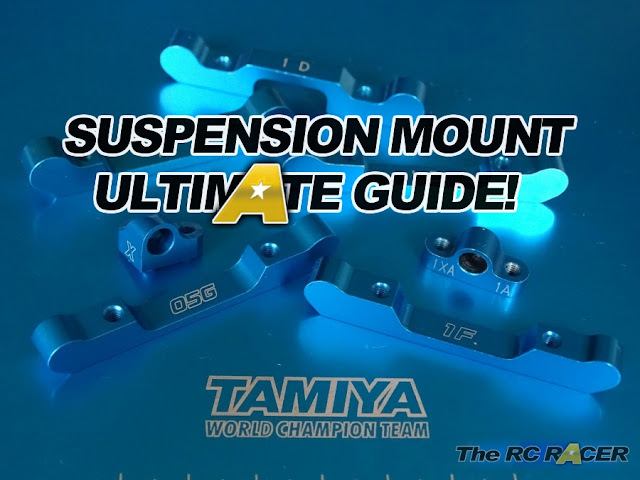 This can effect the full suspension movement on some set-ups. You can shave a little bit of the arm off here, but for this model the suspension movement will not actually be affected. 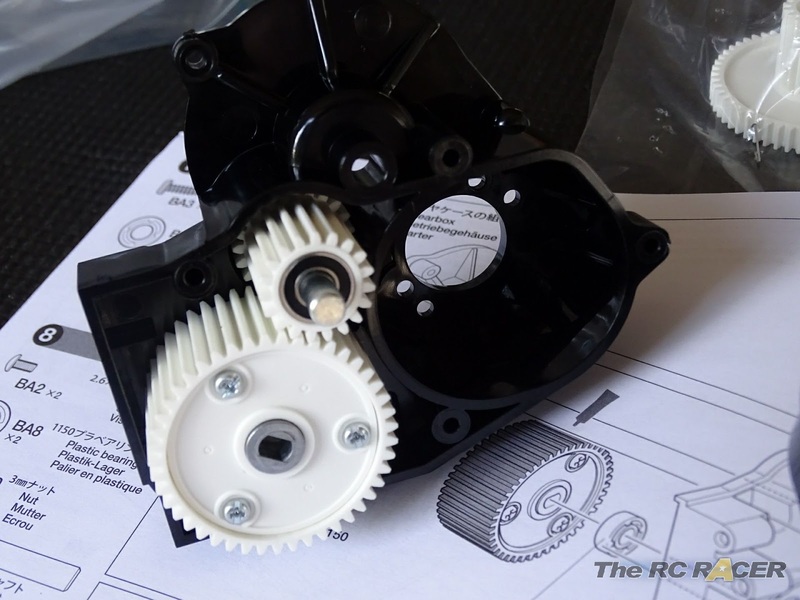 The chunky rear out drives are fitted into the gearbox halves, they are a plastic and metal hybrid and they are very effective in holding the chunky dog bones in place and efficiently getting the power to the rear wheels. 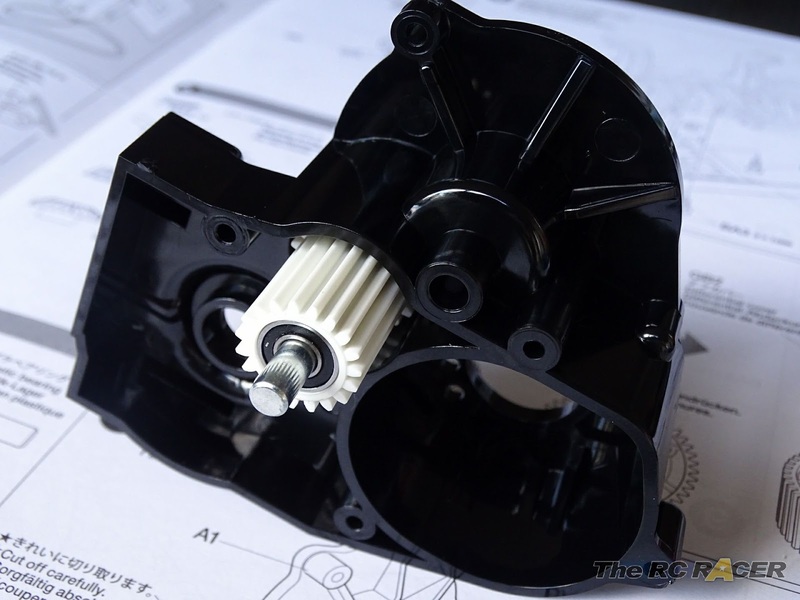 The rear axles also have the large solid plastic cups and they are mounted in the rear hubs via more 1150 bearings. 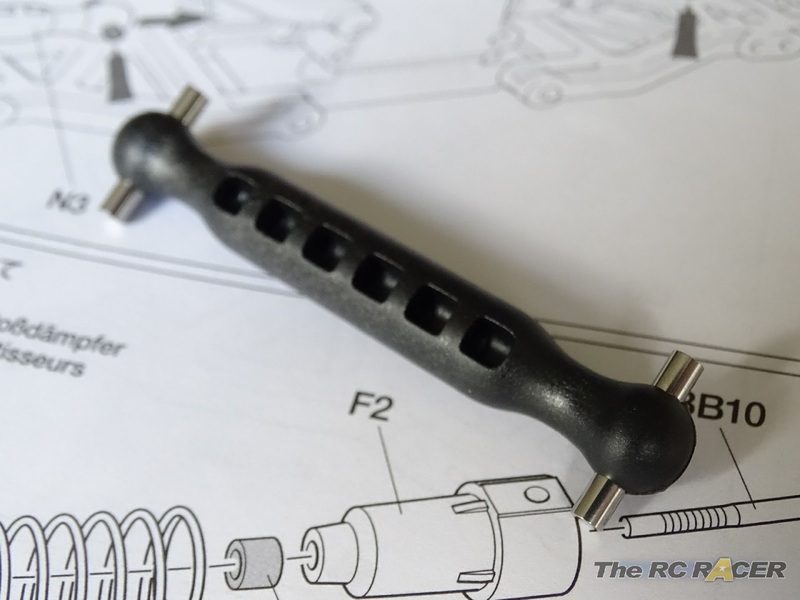 They are then attached to the rear arms with more screw pins, and with the chunky dog bones fitted. We now have font and rear sections assembled in very little time and now we have to make the shocks to mount on them. This kit features plastic shocks that just use rubber tubes and grease as a method of absorbing the bumps. This has been done to ensure that the build is nice and simple for the beginner. They can be upgraded in the future if wanted. I cut the rubber tubes and slapped a lot of the kit included grease inside them to ensure that they would move freely and smoothly. Using a second driver to hold the bottom mount in place whilst screwing it together. The shock is constructed very easily with a long shaft screw that you fit in the main cylinder, through the suspension limited tube and into the lower shock mount. I used a second screwdriver to make this easier to quickly attach as can be seen above. 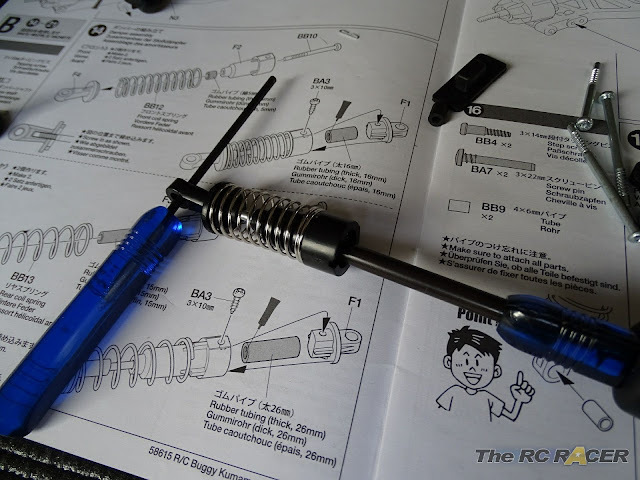 TIP- Check you have trimmed off any pieces of plastic on the shock cylinder with a sharp blade as that can otherwise effect the movement of the spring on the shock, and affect the handling. With the shocks made we fit them to the front and rear suspension arms. To mount his shell you actually fit the front shocks upside down to what you would normally expect. The arms move well and the springs seem to have the right level of firmness. The DT02 has only one upper arm setting but there are two settings in the front lower arms that you can adjust to tune the handling. 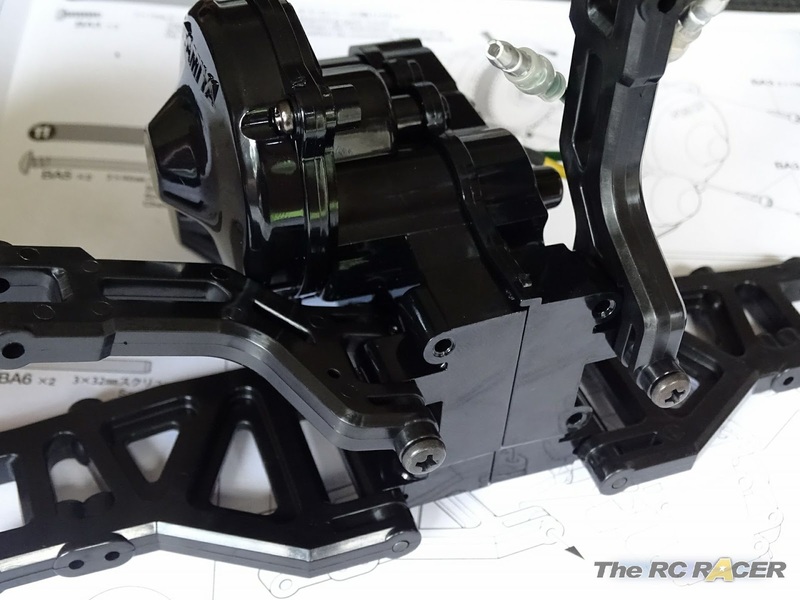 The inner hole will make the shocks stiffer, giving you a little less initial steering but more stability on the corner, the outer one will give you more initial steering into the corner with less stable mid corner handling. Looks like a space invader sprite! 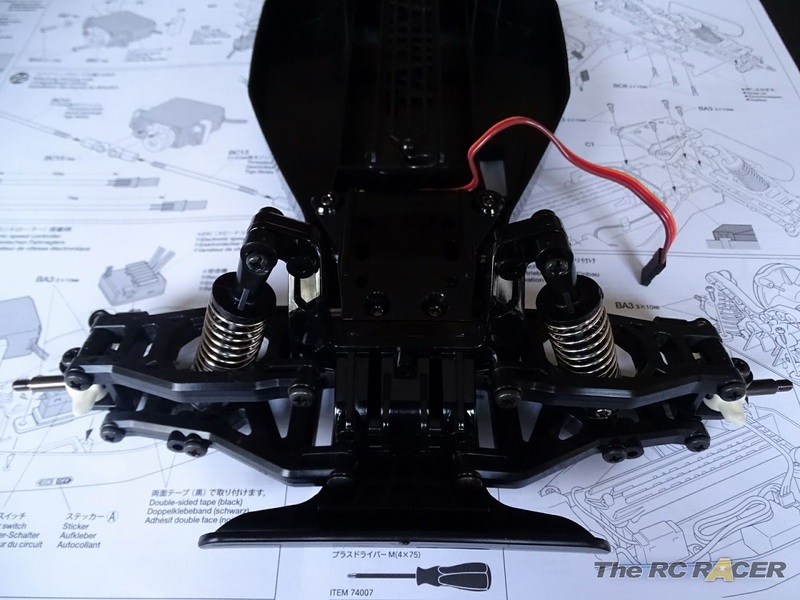 The rear shocks are fitted next, these are mounted onto a solid plastic tower that has two upper mounting positions, there are also two lower mounted positions on the suspension arms to tune the handling. With the tops of the rear shocks mounted on the tower it is attached to the rear gearbox with 4 screws and the lower sock mounts attached to the arms. Now the front and rear parts of the car are virtually finished we need to concentrate on the actual chassis tub. The Chassis is strong and doesn't flex easily when I try to twist it. This stage of the build requires you to fit the battery strap and mount. Tamiya has designed a nice little system which is easy to assemble where you have two plastic hinges that hold the battery strap and allow you to lift it up to change the battery. The strap is then held down with a body clip. Simple and smart. I cut the battery stopper out to fit a square lipo, A very simple mod if you want to use that type of battery. 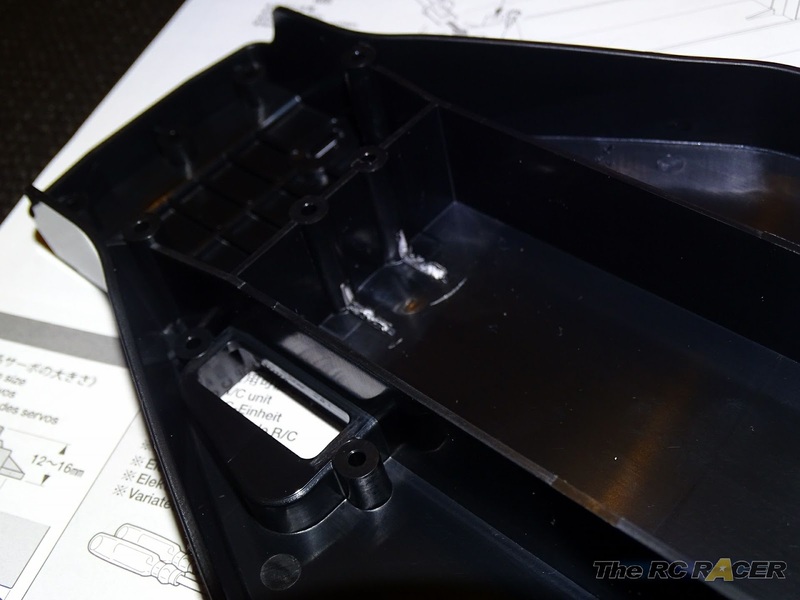 MOD- The DT02 battery tray is large, but it does have some stoppers at the front of the battery bay. These are fine if you are using std round shaped batteries (Nicads / Nimhs) but if you want to use a square lipo then you will need to trim these. It's very simple and I do this at this stage of the build, If your lipo is too tall, then you can also just loosen the screws on the hinges a couple of turns to allow some extra height. I have been running square lipos in my race specification DT02 for years with this method. Now it's time to make the servo saver and to fit the arms. The servo saver has two ball cups that are screwed onto the main plate. Once these are done you will then need to make the two steering rods, you just need to make them to the size listed in the manual. 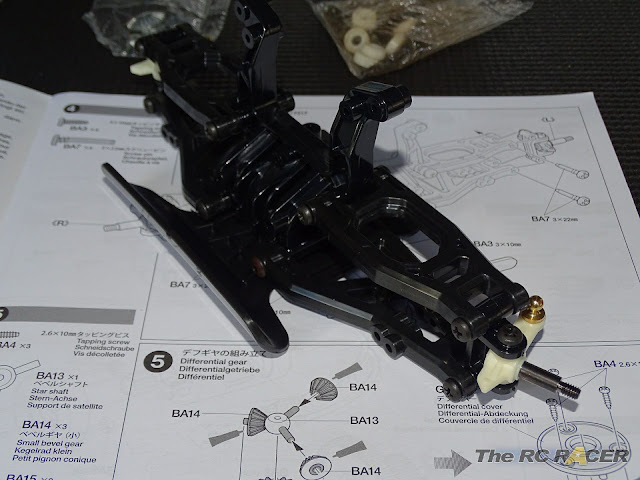 INFO Tamiya's excellent instructions show you the actual 1:1 scale size to measure these parts to so you do not need a ruler or a digital caliper for this stage. At this stage you can also fit the electrics. Tamiya includes the excellent TBLE02S speed control in their kits. 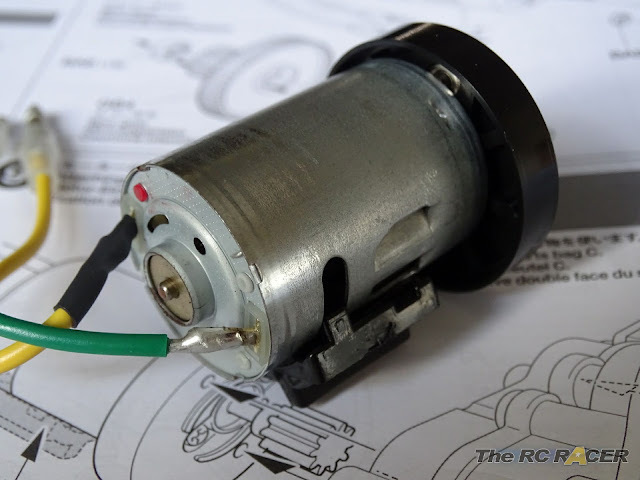 This allows you to upgrade your motor to a 25t brushed motor such as the torque tuned or you can even fit a sensored brushless motor down to to 13.5t. The electrics are mounted with the supplied double sided tape and fit snugly. With the servo mounts fitted to the servo we then attach it to the chassis along with the front bulkhead. 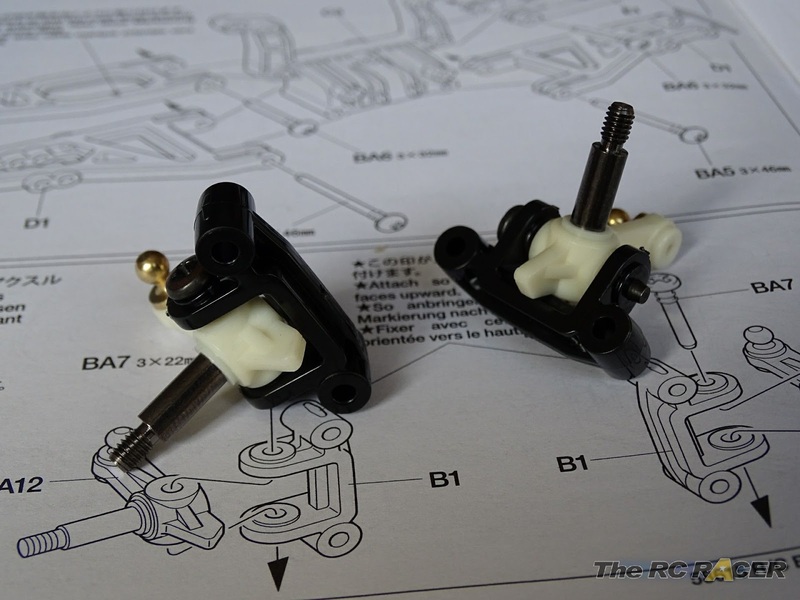 This securely fits to the chassis and we can attach the steering arms to the front uprights. 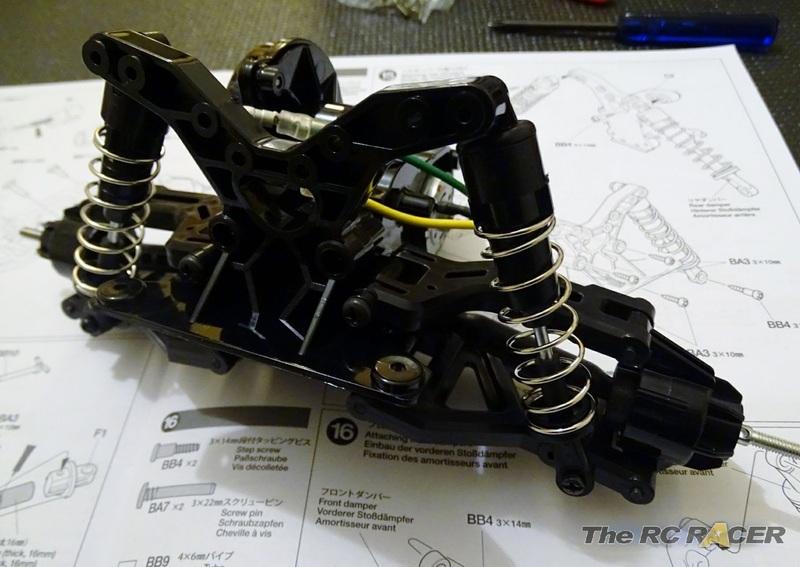 Next up we attach the rear gearbox and the chassis is complete. TIP - If you run a hotter motor than a std 540 you will want to put a small drop of CA (Super) glue on the tyres to attach them to the rims to ensure they do not slip under load. Now we need to work on the beautiful shell. 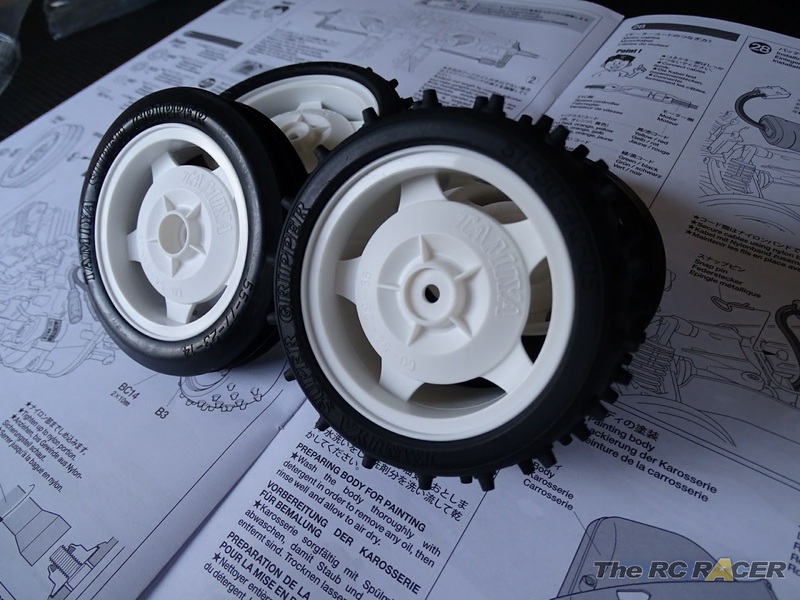 This is a classic Tamiya strength and the hard plastic shell screams character. The shell is moulded in red and you do not need to paint it, however I used some Tamiya TS-85 Red Mica which is the Ferrari F60 paint, and has a nice subtle metallic effect. I few coats of this were applied and the shell looked stunning in the sunlight. I then assembled the roll bar, fitted the windscreen applied the decals and then it was time to put Kumamon in the driving seat and take him for a drive. I was eager to take the car out on the track and the first outing was at our special stunt course (Ahem). The rain was coming so we didn't have long so we plugged in the battery and hit the throttle. Kumamon sprung into life and the rear squatted down under acceleration as the buggy raced off over the concrete. I wasn't expecting much from the 380 motor but the car was much more lively than I expected. 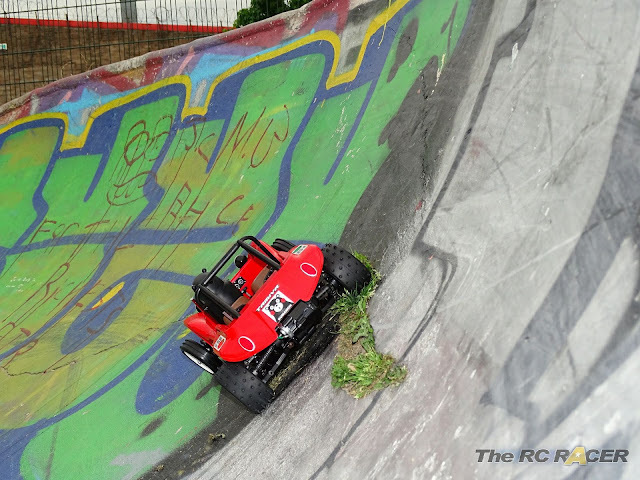 The 4 wheel independent suspension really helped the car maintain a good level of balance over the cracks in the terrain and the motor was capable of pushing the car up and over some of the steep inclines on the course. The car felt responsive and I was soon confidently pushing the car more and more as I chained little stunt sequences of jumps and hooking the car around the tight inclines and swinging the car around building up more and more speed. 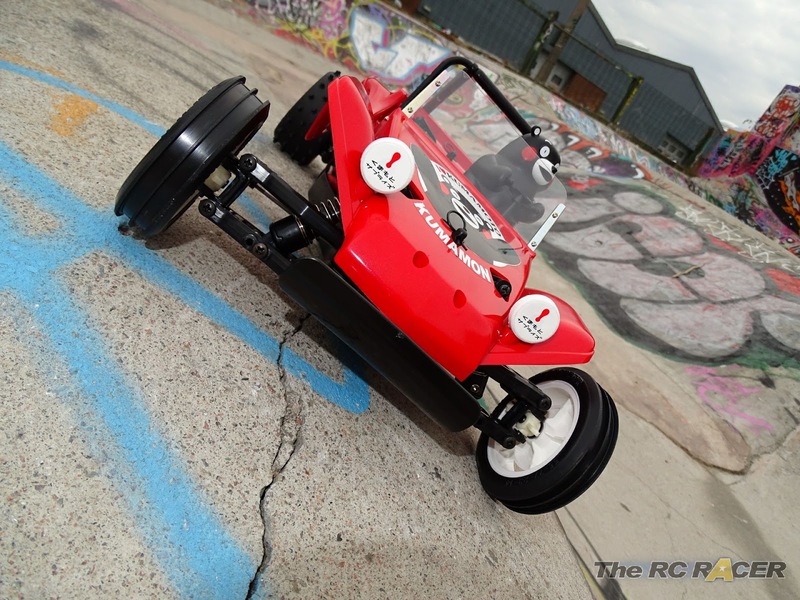 The DT02 chassis is easy to drive so you can just start having fun! The friction shocks were doing a great job in absorbing the uneven terrain, I expected the car to bounce more but the car looked comfortable and quite planted when it hit uneven terrain, the extra weight of the solid ABS shell might help here as the car leaned into the corners. The camera guy remarked on how cool the car looked. One big advantage of the 380 motor is the extra run time that you achieve over the 540 ones. After 25 minutes we were still driving the car. 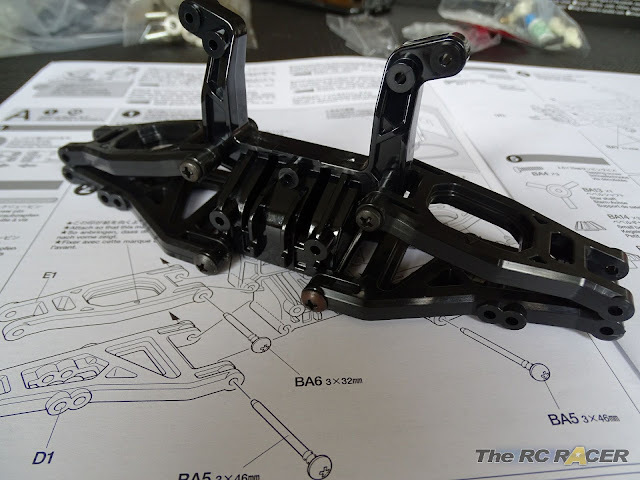 This kit is aimed for beginners and track time is the most important thing to enjoy the hobby and this shows again Tamiya's experience in thinking about the customer. We didn't get to run the battery down as the heavens opened and we had to get indoors as Kumamon is not a fan of the rain. 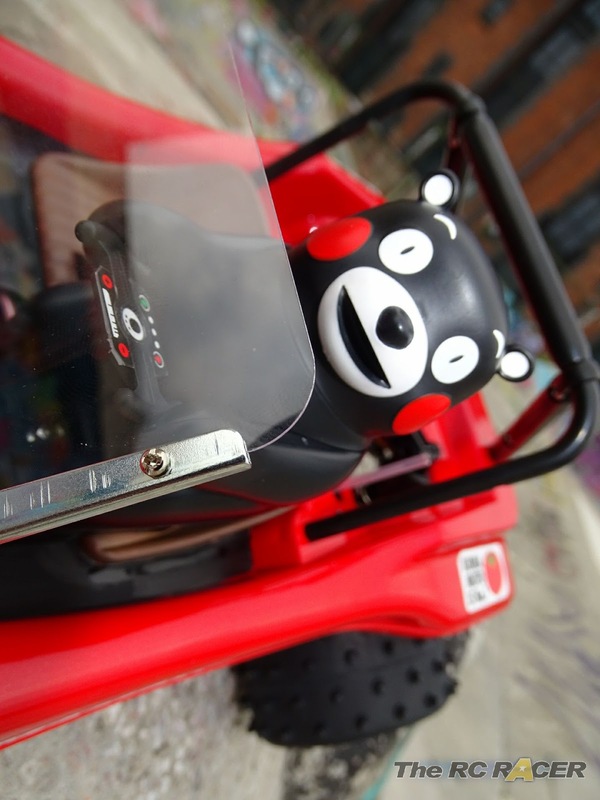 I was on a short break in Wales and I thought I would take Kumamon with me to try to get the buggy running on it's native beach environment. As luck would have it we had a sunny day and the buggy was packed along with the rest of the beach paraphernalia as both my son and myself were excited about seeing the car on the sand. It didn't take long before we got the car out and took it for a spin. The spiked rear tyres threw up a satisfying rooster tail and the car scooted away. The car was able to navigate the soft dry sand well, with the smooth underside helping it to keep moving if the chassis slapped on the sand. Taking a buggy back on the beach, like I used to do as a boy! As we kept driving over towards the harder wet sand the car picked up a little more pace as the firmer sand let the spikes dig in even firmer. The front grooved tyres are perfect for sand and the car was really nimble over the beach. The 380 motor didn't have any problem powering the car over the terrain. My son was loving the experience of driving a buggy on the beach, and it was a great feeling for me as I remember the first time I drove my Holiday Buggy on the beach over 30 years ago with my father and it felt like a rite of passage. 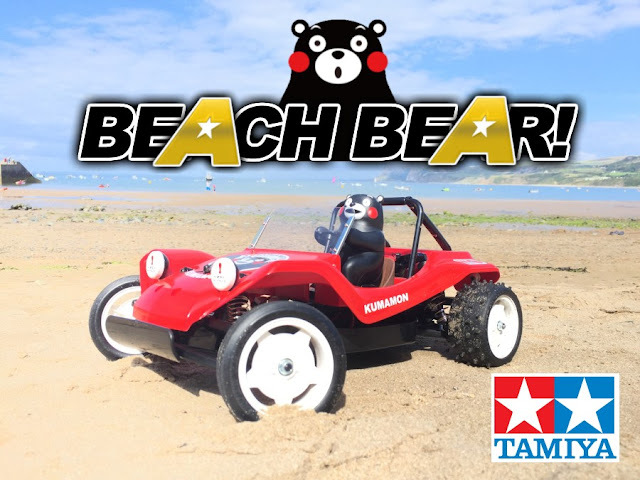 Needless to say the car drew a lot of attention from other beach goers, and there were a few Dads who set off looking for a Tamiya stockist, enthralled with rekindling their youth and sharing a new hobby with their children. This car is designed to be fun, and that is the overall feeling you get from it. It's easy to build, and the DT-02 is a very strong and reliable chassis which handles really well for an entry level buggy. 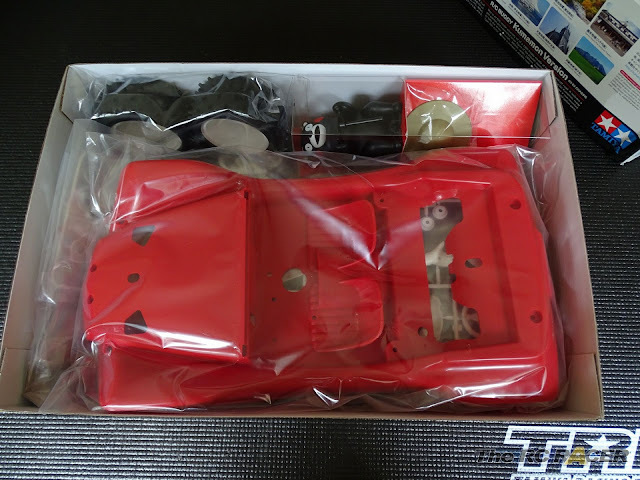 The bodyshell is a classic Tamiya and I prefer the Kumamon behind the wheel over the original driver figure (Although you get the original driver in the kit as well so you can swap it over). As a beginners car it's a good place to start. 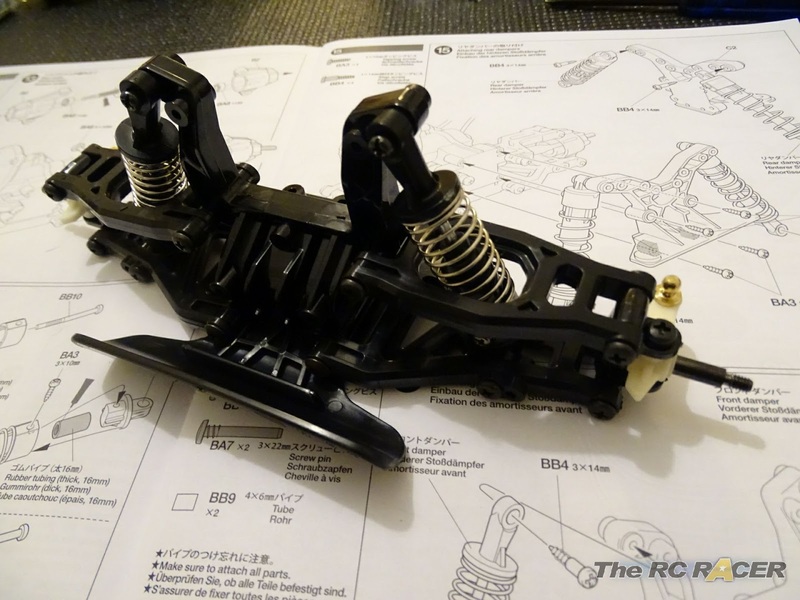 There are a lot of things that you can do to modify the chassis over time (Check out our DT-02 racing article here). This car will be raced in stock form in a few weeks with a lot of other racers at the DT02 challenge. It is a great experience to build a kit with your son or daughter as you embark on the fun and inclusive hobby of RC. This kit could be an ideal one to start that adventure.